« Celebrating the HOAX Series with a #Giveaway! 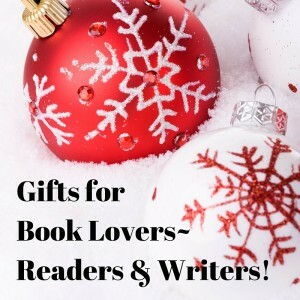 Writer’s Life — #Gifts for Book Lovers—Writers and Readers! Holiday season will soon be upon us—I know!! I’m sorry—and if you’re wondering what to buy that tricky reader or writer on your list, then I’ve got you covered with a few suggestions. Trust me, I’ve been where you are! It can be tough to buy for that book lover in your life because the simplest idea is to buy them… a book! LOL. But which books do they like? What’s their favorite genre? Which ones have they already read? Nooooooo…..too many questions! So here’s a few suggestions. And let’s be clear. These are all things I’d like, but I get no commission or benefit from listing them here. They’re simply stuff I’ve found online that I like! Buy at your own risk. Grammar T-shirt — Who doesn’t like to make fun of grammar? Check out this one! Reusable Water Bottles — Must stay hydrated while reading or writing! I’m currently loving my glass water bottle like this one! Coffee/Tea Cups — I personally love my Kleen Kanteen with a cafe cup. It keeps my coffee hot for hours so I can drink it slowly and therefore consume less. And they come in lots of cute colors too! Check them out here! Quote Scarves — These can be found at a few places. I don’t personally have one yet, but I do think they are pretty cool. I’ve found a few: Here and Here and Here. Himalayan rock salt lamps — I received 2 of these for Christmas last year and I love them! So pretty and good for you too! Book-inspired jewelry from etsy — There is a never-ending supply of book-lover inspired jewelry at Etsy.com. Go check it out! Throw blanket — I love curling up on the couch with a soft blanket and a good book! A great blanket can be found in basically every price range and at way too many places to list. I did see this one recently and it was really pretty. Book Ends — I just found these and I think they are so cool!!! Journals — Great for both writers and readers. Keep track of story ideas, books you’ve read or want to read, make lists of your goals, whatever your heart desires can go in a journal! Coloring books — You may or may not have heard about this most recent fad of coloring books for adults, but it’s true! And I have to say, the coloring books are beautiful! It’s like every page tells a story. Maybe it’ll even bring on some inspiration for what to write or read next! Check out this amazing-looking coloring book!